Ollie is interested in making learning happen. He has fourteen years' experience of teaching science, maths; psychology; printing; chess; meditation; basket weaving and art in many different types of educational environment, including forest schools, mainstream comprehensives, grammar, international, Indian, Sri Lankan and Steiner schools. He believes that we do not learn how to do something when we are told to do it, but when we actually do it. He also works part-time at Stroud High School. He lives with Elie and their two boys near Stroud. 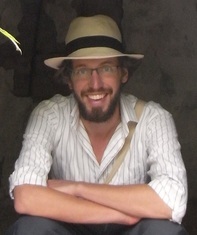 Elie has taught English, geography, and history in both the UK and Asia, and likes being outdoors. She works part time a Pate's grammar school and is an English examiner She runs Lighthouse courses when she's not running after her two sons. Qualifications: BA (Spanish), PGCE (English and Media). Staff have an enhanced CRB and personal liability insurance.